Omnia Opera - "Nothing Is Ordinary"
When Omnia Opera regrouped in recent years, they could easily have played shows with all the old tunes and been a festival favorite. But the new 2-CD set, titled Nothing Is Ordinary, is not a band which after many years just decided to give it another go. Rather, this sprawling 18 track set is a great leap forward. The album flows like one continuous journey, with several of the songs tied together by transitional bits. You've got blazing space rock, floaty-drifty space, songs, narrative bits... it's a great combination. And it's not just one member from the old days putting a new version of the band together. We've got Rob Lloyd on guitar, Andy Jones on bass and vocals, Neil Spragg on drums and electronics, and Captain Bagley on synths & vocals, plus Libby Vale on vocals and effect. I think Ade Scholefield is the only missing early member. Destroyer of Worlds opens the set and is an intense, nearly 8 minute edge-of-your-seat buildup that functions as countdown and liftoff for the rest of the album. And then... SMACK!!! The band launch into Second Skin, a reworking of a song from the 1997 Omnia cassette album, Seeking The Elusive. One thing Nothing is Ordinary does share with the Omnia Opera of old is when it rocks... it ROCKS! And Second Skin is a song that has that classic Omnia Opera Space Bastardy powerhouse space rock with a punkish sneer attitude. After this 8 minute assault we're treated to meditative mind-massage with Genus of Angels, a drifting soundscape journey with soothing narration. And that's what this album is about. There's lots of variety and it really plays like an ALBUM, and really needs to be heard as a whole album. Other songs that will appeal to fans of the band's heavier music are Pictures On The News, The Malgi (Illusion of the Mind), Mr Sludge, Under the Sun, and Big Brother, a monster new version of a song I first heard on their 1989 Live cassette. The Liquid Underground is another old song the band have revisited, having been originally recorded for the 1987 Celebrate for Change cassette, and is one of the powerhouse tracks on the new album. Great saxophone on this one by guest Sarah Jones, plus wailing synth lines and ripping guitar licks. But we've also got peacefully gorgeous spaced out songs like the title track and Leaning Backwards, the latter being a serenely floating close to the set. The title track is a highlight, being a spiritually uplifting song with beautiful keyboards, synths, and a killer guitar lead. 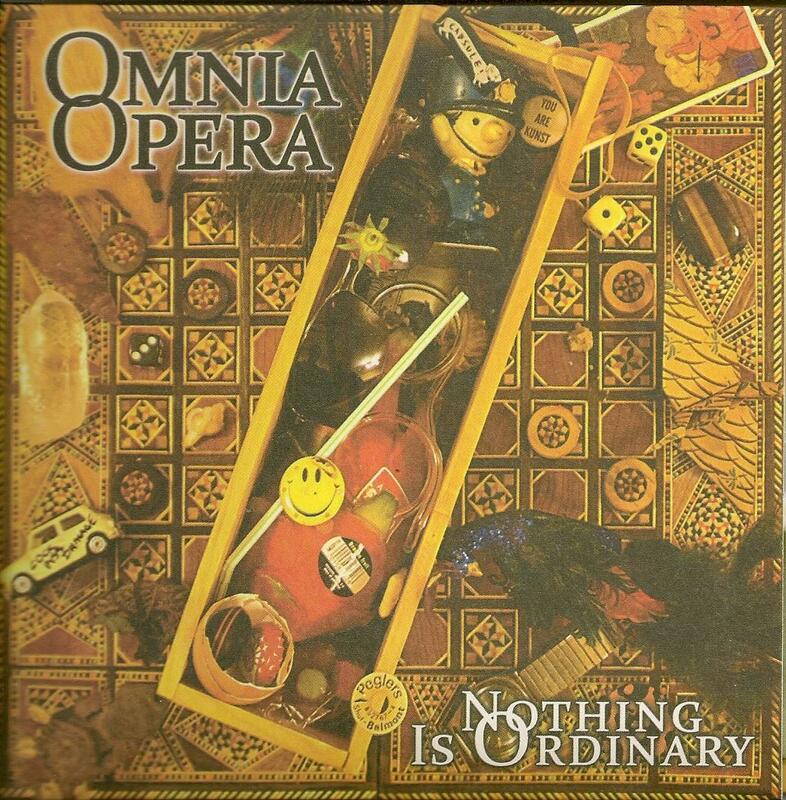 I'd been on edge wondering what kind of album Omnia Opera would come up with after all these years and must say after several listens that I consider Nothing Is Ordinary to be a raging success. I have to mention the packaging too, which is beautiful. The 2 CDs come in a cardboard tri-fold with really nice artwork and includes a thick booklet with all the lyrics. This is the closest you'll come to the old vinyl gatefold within the limits of the CD format. Who knows, maybe if the CD is a success they'll do a double LP edition? You want Space + Rock? Check this out. It'll be high on my Best Of list for 2011. CLICK HERE to read a 1999 Omnia Opera interview from Aural Innovations #8.